You know, I never really cared much for this film. I've always wanted to though. 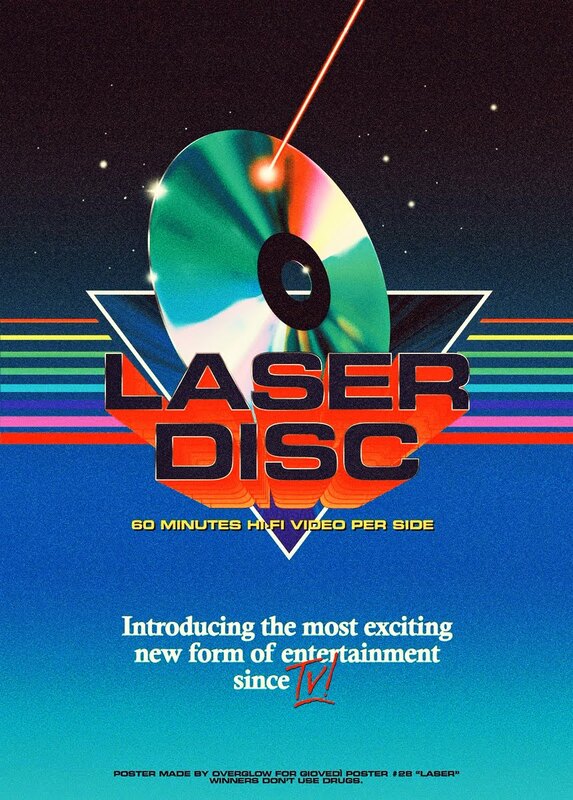 It has all of the things I love about these types of films, and the fact that it was made in the 80's made it all the more frustrating that it just didn't utilize all of it's core ingredients to it's full potential. It never really hit the mark as they say. I would find myself going back every few years to revisit it, but always leaving underwhelmed for the most part. I never disliked it, but I never fell in love with it either. So here we are yet again, another few years later, and I'm ready to give this a try. 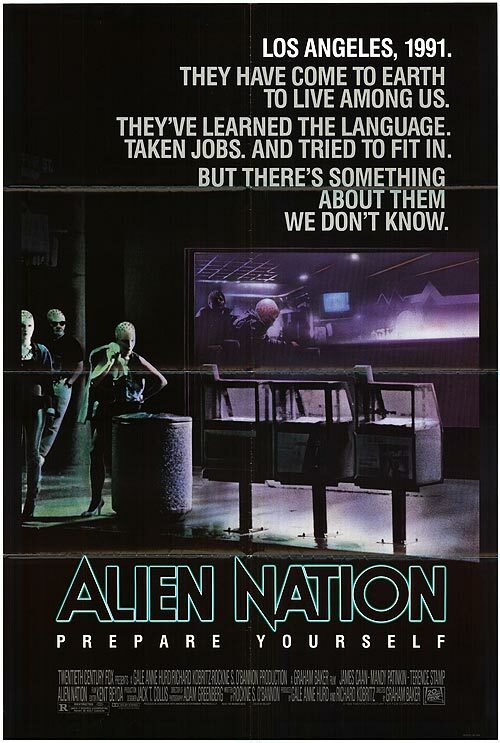 I don't know what it was specifically, but I ended up loving Alien Nation this time around. That's right, after countless tries, something clicked and I thoroughly enjoyed it. And I've put a lot of thought into why that might be. I think when I've gone into this in the past, I expect a more action/sci-fi oriented film. I mean, it's produced by Gale Ann Hurd (The Terminator, Aliens), and it has everything in it that would lead you to believe that that's the type of film you're going to get, but I would always walk away surprised at how little action there really is. While it starts off with a bang, and I should say a strong bang, it never delivers on that badass opening. Sure there is action sprinkled throughout, but it's very minimal, and conventionally unmemorable. What I discovered this time around, and appreciate now that I understand, is that this is really more of a cop/buddy thriller, and not an action-oriented film. And that's fine, because it ultimately stands out from the crowd in that respect and has more in common with films like The Hidden and They Live (somewhat) than with what you're expecting in a conventional sci-fi/actioner. Really, there is a lot to love about this film. For starters, the camaraderie between James Caan and Mandy Patinkin is excellent. They really are a winning team and had this film been a big hit, I am pretty confident that they would have continued making a few more a la Lethal Weapon style. But alas, it was not and this was the only one we got, not including the Made-for-TV movies that followed. Their chemistry just comes across so natural, and after a few minutes, you soon realize how spot on and brilliant the casting was. It's so good in fact I feel a bit sad that they weren't able to continue this special relationship onscreen. One of Alien Nation's biggest strengths is the tight, sure-handed direction of Graham Baker (The Final Conflict). whe gives the film a strong, gritty yet slick style reminiscent of the type of action oriented thrillers that were prevalent during the 80's and 90's . I dug it quite a lot, and felt it really made the film better because of it. Looking into his filmography, it seems he never quite reached the level of success or quality as this one, so it appears this was his crowning achievement in that respect. He would only direct 4 other films after this, all of which went straight to video. Whether you actually like the film or not, you can't deny that it's a great looking one. 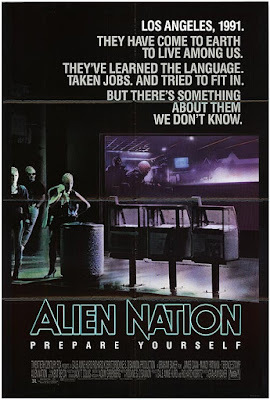 Talking to fellow filmgeeks, Alien Nation really seems to divide people quite drastically. Some really love it, while others do not. I suppose the same can be said about most films, but there are always a few that really hit that very specific and delicate balance where it can easily fall into either category by a single hair. This is one of them. And I'll be honest, I didn't like it myself for the longest time, only to have a complete reversal this time around and I was rather shocked. But I love it. 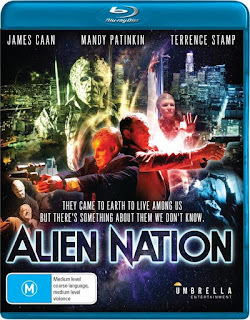 I love it quite a lot and though it doesn't have a lot of action, which I would have loved, it delivers solid entertainment in the cop/buddy thriller genre; like a detective procedural film, only with an alien twist, set in a modern future circa 1991. It's because of this not-too-distant-future setting that allows the film to remain small and grounded in reality, which makes it even better. Aside from the aliens, or newcomers as they're known, the city still looks like a typical industrial city circa 1988 (the year it was released), so that means no flying cars or anything of that nature. And really, it's a better film for it. It keeps things simple so you can focus on the characters and the relationship between Sykes (Caan) and Sam Francisco (Patinkin). In addition, if you pay attention, you also get to see some cult icon favorites like Jeff Kober and Brian Thompson sporting newcomer makeup in supporting, if albeit, extremely minor roles. And then there's Terrence Stamp, while amusing, doesn't really elevate the typical generic role of the well-dressed villain to new heights here, instead playing it safe, and ultimately unmemorable. If you go in looking for an action/sci-fi film, like I did, then you'll probably be disappointed. But if you can look past that, and understand that it's more of an 80's detective procedural thriller more than anything, I think you'll really enjoy it this time around. 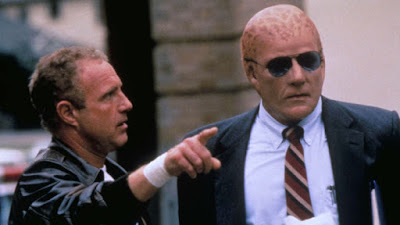 The cop/buddy dynamic of James Caan and Mandy Patinkin is gold, and Baker's slick direction, along with Stan Winston Studio's makeup/effects work elevate this far above what you might expect given the right frame of mind. Keep meaning to check this film out. I've caught a few episodes of the TV show recently and quite enjoyed it. I really enjoyed it this time around, and I'm looking forward to checking out the series as well as the TV Movies. Not expecting them to be as good, but hopefully solid entertainment. Thanks for stopping by Jack!